The perfectly breaking waves and tropical, warm waters in Hawaii have often been called a surfer’s paradise and for good reason. Surfing in Hawaii is a large part of the island’s culture and the ancient sport of surfing is deeply rooted in the blood of many native Hawaiians. Although surfing is now considered to be an extreme sport that is loved around the world, in Hawaii it is much more than that. Surfing in Hawaii is more like a religion and from past to present has made up a large part of the island’s social culture. While no-one can tell you exactly when and where surfing originated many believe that the popularity of modern surfing can be traced back to the beautiful island of Hawaii. The first written records of the sport date back to 1778 when Captain Cook wrote about it after visiting Hawaii. However it is believed that ancient Polynesians were surfing way before this and there is even evidence through Hawaiian hieroglyphics that surfing on the island was being participated in as early as 1500AD. Surfing and Hawaiian religion are strongly related to each other and have been for thousands of years. In the early days Hawaiians believed that the sea had distinctive moods and that its actions were in relation to these. Kahunas (special priests) would pray for the surfers whilst many in the community would perform rituals and special dances with the aim of pleasing the sea in the hope that she would reward them with perfect waves. The creation of surfboards is also a religious ceremony in the Hawaiian culture. Before a surfer was able to craft a surfboard for himself he would take special care in selecting the perfect tree and then pray for it and place a fish in a hole at the base of the tree. Only three types of trees were suitable for this task (the koa, wiliwili and breadfruit) and the heaviest and largest surfboards were reserved strictly for the Hawaiian Royals. As said above, surfing in Hawaii was much more than a sport and in fact it was an integral part of the Hawaiian culture. Surfing was directly related to the government on the island with the chief of the island at any given time being the best surfer in the community. In order to maintain a hold on this standing he would practice regularly on the waves in order to maintain his strength and skill. The sport in Hawaii is called he’e nalu which literally translates as wave sliding and the surfboards that each member of the community owned would depend on their class. 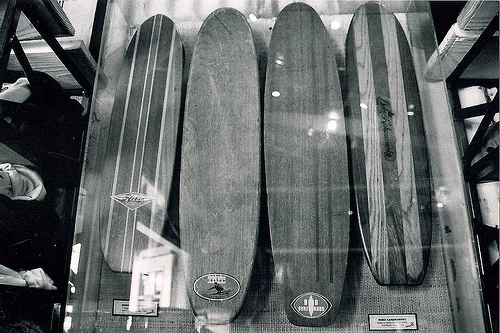 The larger the board was and the better the type of wood used, the higher the surfer was in society. In addition surfing was often used as a way to settle community disputes with surfing competitions deciding the outcome of everything from wealth and land ownership to love disagreements. Over the years groups of people have tried to interfere with the Hawaiian way of life and this has led to disruptions in the history of surfing in Hawaii. The best example of this relates to the 1820s when Christian missionaries attempted to abolish Hawaiian culture and with this the surfing. Although the sport almost ended here a group of native Hawaiians brought the sport back to life in 1905 and within years it had grown in popularity to become an integral part of Hawaiian society yet again. As the sport grew many travelers would visit Hawaii and be mesmerized by the surfing lifestyle. Some of those carried the spirit of the sport back to the mainland US and before long surfing had grown into the immensely popular extreme sport that we know it as today. Although states like California and Florida are now visited by surfers around the world, it is widely believed that there is no better surfing destination in the world than Hawaii. Hawaii truly is a surfer’s paradise. With warm waters, spectacular beaches, stunning marine life and constantly changing surf spots it is no wonder that surfing in Hawaii is said to be the best in the world. This entry was posted in Hawaii, Surfing, Travel, United States, Water Sports and tagged Hawaii, History, Surfing. Bookmark the permalink.